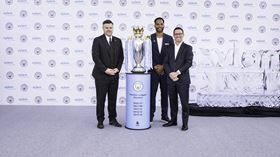 Pictured at the launch event at Singapore International Water Week (l-r): Damian Willoughby, Senior VP of Partnership at City Football Group, former Manchester City player Joleon Lescott, and Patrick Decker, president and CEO of Xylem Inc.
Xylem Inc has entered into a global multi-year partnership with English Premier League Champions Manchester City to become the football club’s official water technology partner. Through the partnership, Xylem aims to raise awareness about global water challenges and solutions. Xylem will also work with the club on Xylem Watermark projects, such as building water towers in communities around the world without access to clean water. Xylem branding will feature at the club’s Etihad Stadium on match days and at the City Football Academy. 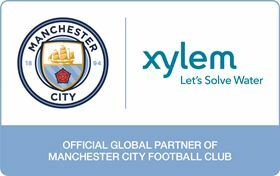 Xylem will also partner with Manchester City’s sister club New York City FC and the Manchester City women’s team. This is the first deal of its kind in the Premier League. The partnership was announced at an event during Singapore International Water Week, which was attended by the club’s Joleon Lescott. Under manager Pep Guardiola, the club plays its domestic and UEFA Champions League home fixtures at the Etihad Stadium, a 55 000 seat arena. The Etihad Campus encompasses the City Football Academy, a state-of-the-art performance training and youth development facility. Featuring a 7000 capacity Academy Stadium, the City Football Academy is also where Manchester City Women’s Football Club and the Elite Development Squad train on a daily basis and play their competitive home games. Manchester City is one of eight teams comprising the City Football Group which includes New York City FC, Melbourne City FC, Yokohama F Marinos, Club Atlético Torque and FC Girona. Pentair has been named a founding partner of the Minnesota Vikings’ new US Bank Stadium in Minneapolis, Minnesota.